Today I went over to the Osaka Kyudojo. I was nervous, I was unsure of the reception and what I was going to do/show, if I was intruding. 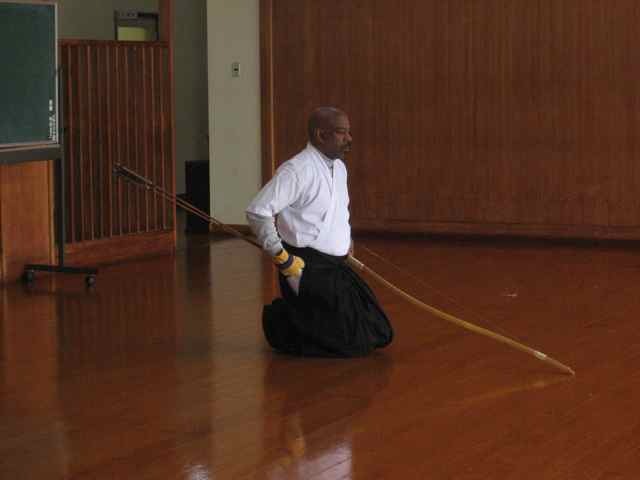 We had called before hand from the States, so someone knew we were coming but I was unsure if Nogomi Sensei had gotten the message. My fears were unfounded. When we first arrived, everyone was eating lunch together, so I was instructed where to change . 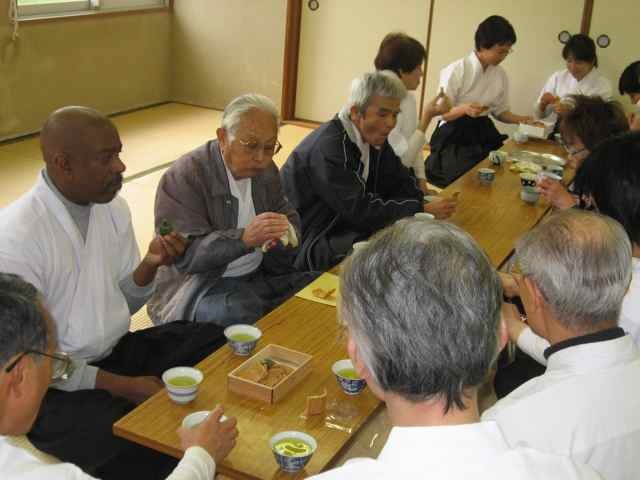 After lunch I was brought over to Nogomi Sensei, he was pleased to see us and thanks us for the gifts and pictures we had sent last year. We told him about our visit and the plan for me in Tokyo. He said he used to judge at the events in the past before he retired. He then said I should go practice. I went to the room next door and had at it. I thought Dai -Sensei would just drop in and I could show him my tai hai. However after awhile I was sent for to come join the group!! I was so nervous also added to that I was struggling to remember polite Japanese not the equal level stuff I speak with LZ! I was unsure if I should do sitting or standing form. Everyone else was doing standing so I felt really unsure. I started with one, then went into standing since that is what everyone else was doing. Dai-Sensei went, eh?! What are you doing? Then I explained, rather LZ explained I was extremely nervous. He laughed , I was told Daijoubu and I started again. Anyway It was pointed out I was doing several things incorrect. I was not feeling I was doing anything correct. I was not feeling bummed out about it, just very awkward and all eyes were upon me. However better than last time I was here. Things were not as I expected so I just tried my best to go along. The folks there were helpful in assisting. They most likely knew I felt sort of lost. 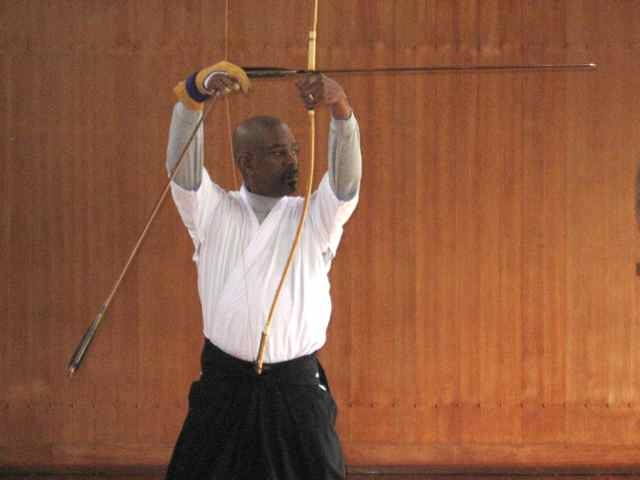 Other than my blowing my Honza/Shai approach the biggest issue was my Taniuchi holding the yumi whilst in Douzokuri and straightening my left arm more when doing Daisan and Hikiwake. Turning my arm so my elbow was down more and locking in through the body. 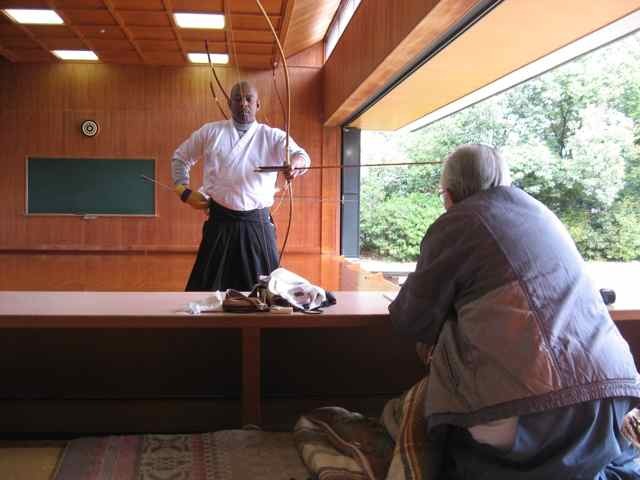 Afterward I was speaking with another Sensei. She told remembered me from last time. She said oh, you were doing Shamen last time, now Shomen. Yes I replied. 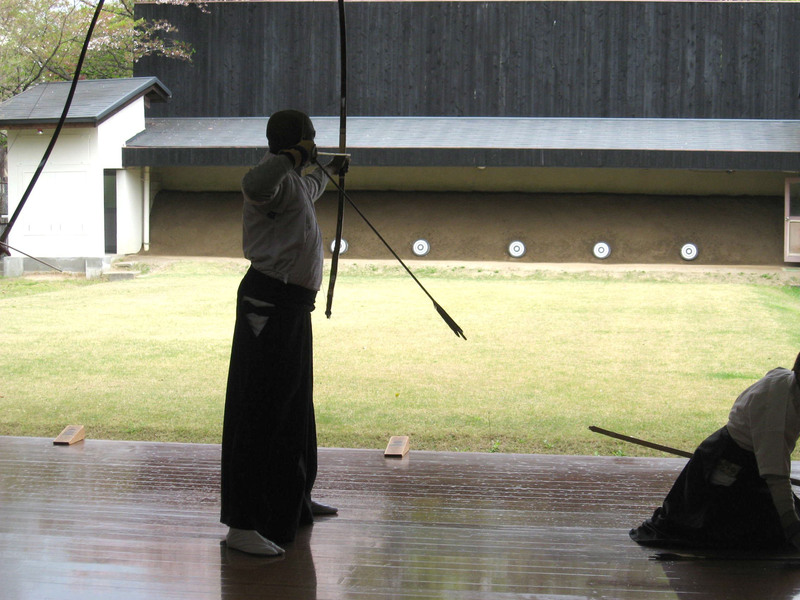 We talked a bit about style, difficulty, Kyudo in the States, Zen and Kyudo, etc. She thought the seminar would be good because the Senseis there are used to teaching Foreigners and knew how to explain things. 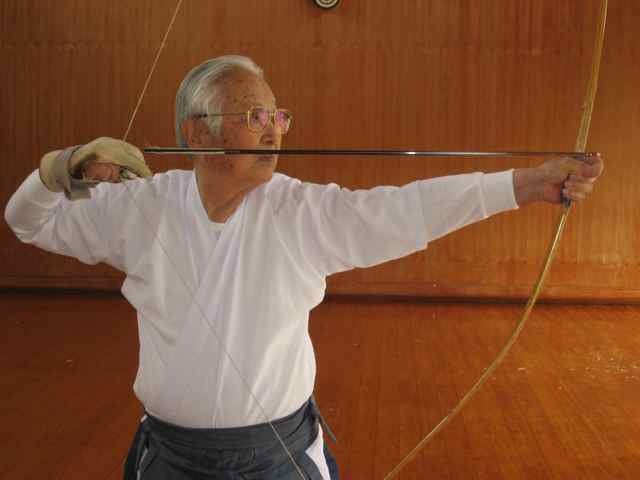 Her feelings on Zen and Kyudo and “budo” and Kyudo was there was no separation. 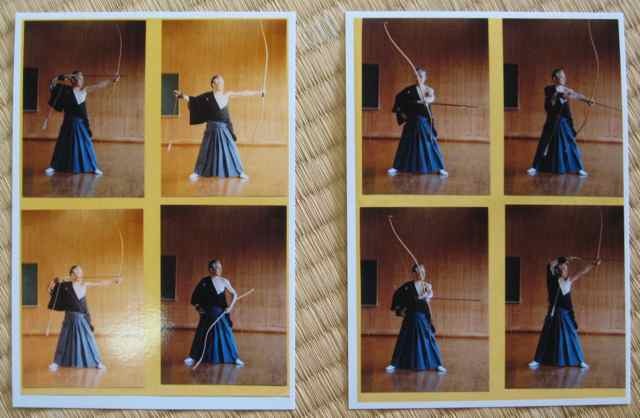 She had a book and gave us print out on Zen and Kyudo from the book. LZ will need to translate. 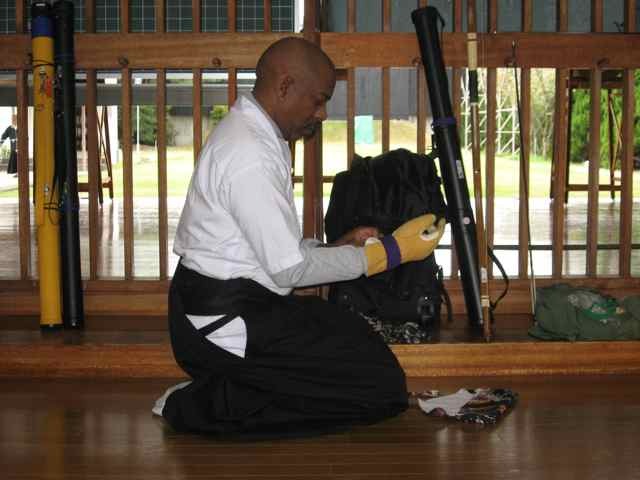 This book was written by the Sensei that just past away last year. I found out later from Nogomi Sensei this woman Sensei was also a Tai Chi instructor. We noted there were several people in the class that Dai-Sensei said they are Sensei. 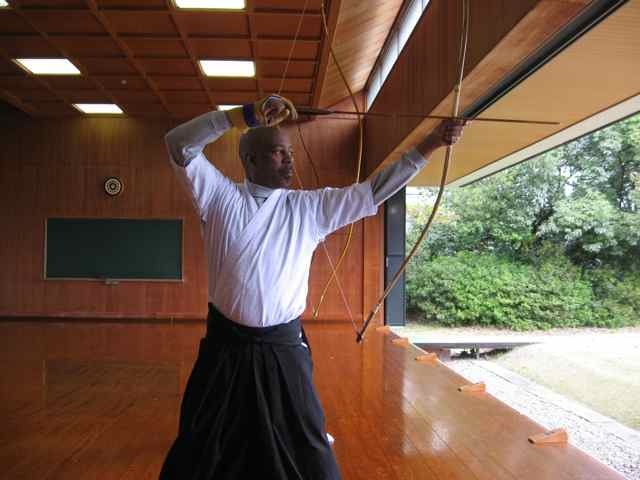 Nogomi Sensei at one point took a break and called me next door. 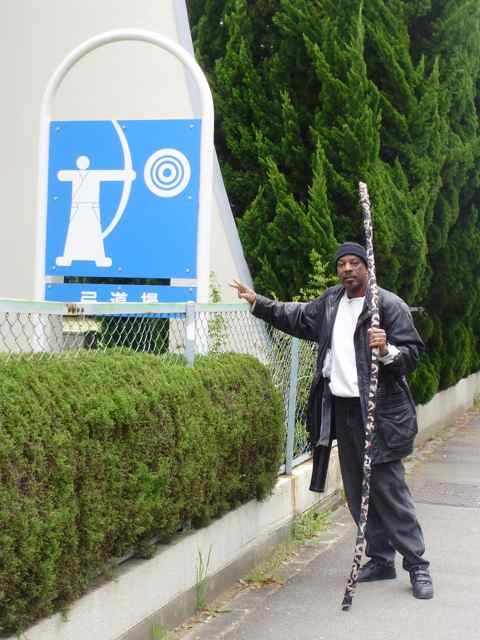 He showed me and another the correct way of Dai-san and Hikiwaki, both Shoman and Shamen. I was directed I should get in line and practice with the group, but stand near the front of the line so I could be seen by Nogami Sensei. 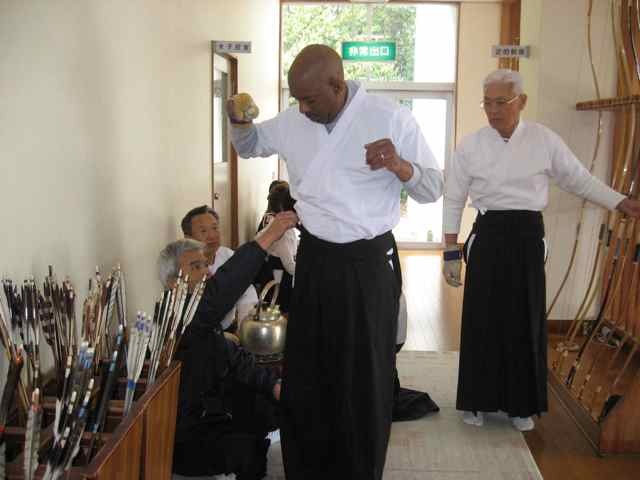 I did so of course and received instruction from Sensei and another . The next bit, well two bits, were unexpected. I asked for another picture with Nogomi Sensei, he said, we can do it with everyone. 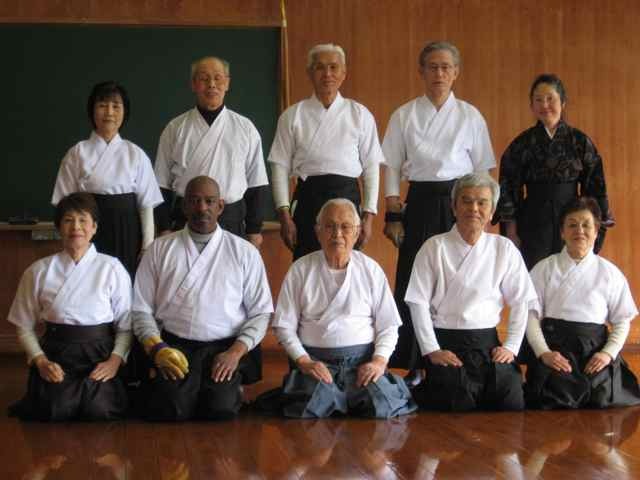 So he had everyone line up for a picture together I was told to sit in the front next to Sensei. Afterwards, it was time for a break we were invited into the changing room were everyone sat and had tea and some amazing special mochi, made from Sakura and green tea and beans. Sweet but not SWEET, hand made it was SUGOI OISHII. It was at this point I feeling more part of the group, not just a visitor. When I told LZ take a picture, a few laughed and said , yeah, evidence ne! 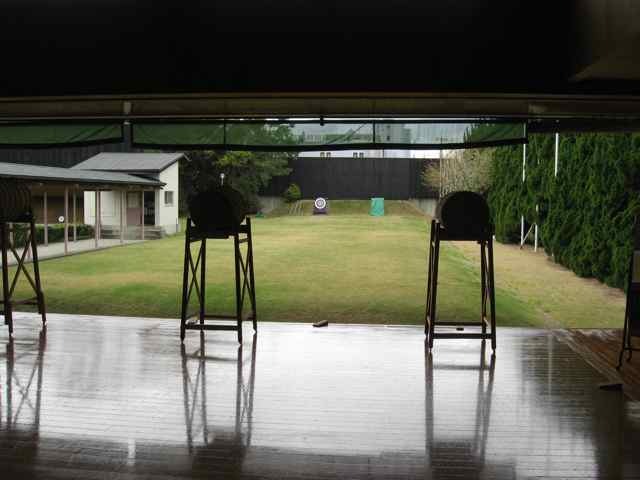 Afterward more practice, and another time in front of Dai-Sensei, I was helped with my standing form and orientation to the shooting line, which I was blowing, yet Dai-Sensei was patient and had someone help me. I felt better on my next to last shot when I got a dead center bulls eye and heard a couple of exclamations from behind me… yeah baby, Yatta! Even though I did not hear what was right, since what I heard what was wrong was not really that much considering everything, I’m believing over all I did ok, otherwise I’m sure I would have heard more than I did. He told me I could come back any time and he would teach me. I should not be concerned about bring him gifts, he was happy just to see me. As far as I was concerned, my trip was made. It mattered not if I get Shodan or not at that point, I was in with the group and made some important future connections. Whoot! Nihon is all about who you know. What a wonderful experience you are having. Sounds like a good trip! Meeting those that love and share the things we hold close to our hearts is always fun. It was a pleasure to finally meet you in Japan… just not enough time to see and do it all… not enough time to spend with friends. I tell myself there will be other opportunities… I hope so. You have inspired me with your writing, I’m shopping for a bow now. thank you very much indeed, I’ll check it out for sure.